“Alternative facts.” The new term coined by our current presidential administration nine days ago has been repeated in headlines, tweets—and most recently, ads like this one from Dove. 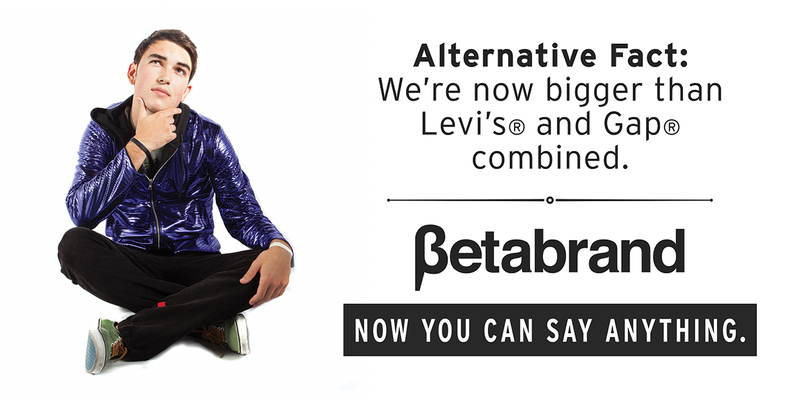 Retailer Betabrand has launched a new “Alternative Facts” campaign online and on billboards in the San Francisco area. Each ad boasts an outrageous claim with the tagline, “Now you can say anything.” The ads launched around the same time as that two-page print ad that Dove released in the U.K. giving “alternative facts” about its new antiperspirant. Interesting to note: Some of the ads don’t have the “Alternative Facts” header and aren’t incredibly intuitive without it. The images on Facebook are getting mixed reviews. Some people love them (“Good advertising LOL”). Some people don’t get it (“You guys know you’re not even close to being as big as Levi’s or Gap … you know that right?”). And as expected, some people hate the dig at the current administration, although—as with the Dove ad—Betabrand doesn’t call out Trump, Conway or Spicer by name.